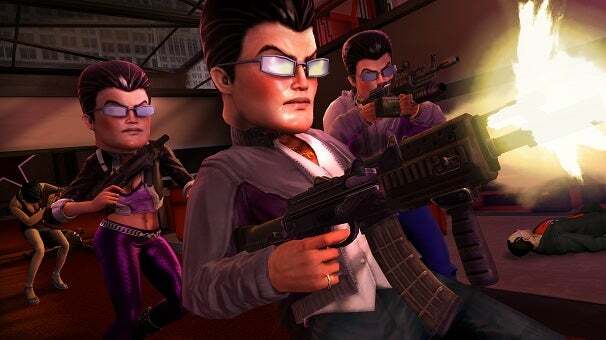 Volition's Saints Row was once regarded as little more than a shameless Grand Theft Auto clone. But times change, and while GTA has evolved into a mature open world drama, Saints Row: The Third goes in the complete opposite direction. From these highlights, it's fair to say that Saints Row: The Third is not trying to be Grand Theft Auto. There's a plot, in which the Saints gang tries to conquer a new city after freeing their old haunt from an evil corporation, but there's also a clear focus on making the playground as ridiculous as possible. "Sometimes, there was a lot of alcohol involved," writer Drew Holmes said when I asked him how the developers brainstormed. He explained that with Saints Row 2, a lot of the game's positive feedback was related to its wackier side, so the team decided to play up those over-the-top moments in Saints Row: The Third. "We could really own that space," he said. The E3 demo included one actual mission -- a bank robbery gone wrong -- which looked amusing if only for the banter between characters, but I'm a little concerned that the gunplay remains stuck in the past. There was no cover system, just a lot of aiming and shooting at a steady stream of targets. If the rest of the story missions aren't more ambitious, players may never want to leave the sandbox -- although that doesn't seem like such a tragedy. Saint's Row: The Third launches on November 15.